Compare discounts for Hotels Motels Resorts in Baltimore, Maryland! Baltimore is sometimes referred to as 'this thing between Philadelphia and Washington DC'. While the statement is geographically true doesn't do justice with Baltimore. The Inner Harbor is the heart of Baltimore and Harborplace, a three-acre retail and entertainment complex that anchors it is the Inner Harbor anchor. The Inner Harbor's attractions include the Maryland Science Center, the National Aquarium, Oriole Park at Camden Yards, the U.S.S. Constellation, and the Pier Six Concert Pavilion. In addition, the Inner Harbor is home to several top Baltimore hotels, many fine restaurants and two marinas. Downtown Baltimore is centered at the intersection of Charles and Baltimore is the heart of Baltimore's business district. The surrounding blocks are easy to navigate and are all within walking distance of most of the downtown hotels. Note: Lists are not identical. 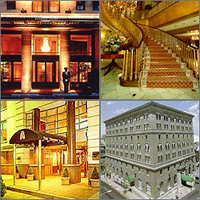 Different sites offer different accommodation options for Baltimore. The Baltimore Washington Airport Marriott is conveniently situated one mile from the airport with complimentary shuttle service available to both the airport and the BWI Amtrak station. The Pier 5 Hotel is one of only two waterfront hotels in Baltimore. It is located on the east side of Baltimore's famous Inner Harbor - on Pier 5. The Tremont Plaza Hotel is an all-suite property conveniently located in the hub of downtown Baltimore's cultural, business, shopping, and entertainment districts, within walking distance of the Inner Harbor, Oriole Park, and Little Italy. Conveniently located downtown on Baltimore's Inner Harbor, the award-winning Renaissance Harborplace hotel is within walking distance of many popular attractions including the Maryland Science Center, National Aquarium and Oriole Park at Camden Yards. Located in the heart of downtown Baltimore, Sheraton Inner Harbor Hotel is one block from the Inner Harbor, two blocks from Oriole Park at Camden Yards. Experience elegance at the unique Wyndham Baltimore Inner Harbor hotel just five blocks from the Harbor. The Clarion Hotel Mt. Vernon Square, a European-style boutique hotel, is located in one of the most architecturally rich neighborhoods in the country; Mt. Vernon Square. The Hyatt Place Linthicum Heights is an all-suite hotel. The hotel designed by business travelers Courtyard surrounds you with all the conveniences that make business and pleasure travel easy. Located 1 mile from Baltimore's Inner Harbor, this Fell's Point hotel is listed on the National Registry of Historic Places. The Brookshire Suites is a great hotel located near the harbor in downtown Baltimore. The hotel is conveniently located not far from many attractions such as the Museum of Art National Aquarium Baltimore Symphony Orchestra Baseball Center and the Star Spangled Banner Flag House & 1812 Museum. Guests will enjoy the quick and easy access to other interesting places including Street Car Museum Maryland Science Center Baltimore Zoo and Babe Ruth Birthplace.